Please note: We have no litters at the moment, and currently no further plans to breed. We recommend looking on the Northern Hamster Club website for a list of breeders and up and coming shows. Hello and thank you for visiting! 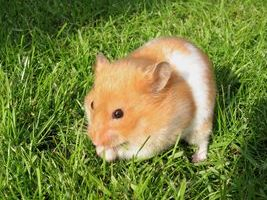 LeedsHams is a small hamstery in Leeds, specialising in Syrian hamsters. Please feel free to have a look around! I first began keeping hamsters as pets when I was about 8 years old, and I've loved keeping them ever since. I first began breeding in 2008, with my first hamster Stewie (pictured right). After a lot of research into breeding, finding out more about show quality hamsters and talking to other breeders, I picked up a lovely girl called Molly from my very first show. It all started from there, and the babies we have here now all decended from Stewie, who had the most amazing temparament, which he passed to all his children, grand children, great grand children and so on. I am a member of the Northern Hamster Club, and am committed to breeding healthy and tame hamsters.